What is behind knee swelling? A swollen area that can be felt behind the knee can be caused by several different conditions. A Baker’s cyst is a collection of synovial fluid (fluid that is present within joint spaces) that bulges out through the back of the knee joint and can be felt in the back of the knee as a lump or enlarged area. Knee injuries, arthritis, damage to the cartilage of the knee, and other problems are known to cause Baker’s cysts. Swelling behind the knee may be painful or may not produce any other symptoms. In some cases, you may notice tenderness, warmth, difficulties moving your knee joint, muscle weakness, or bleeding or bruising. Injuries to the knee, including sprains (damage to the stabilizing ligaments of the joint) can lead to diffuse swelling of the knee area. Other possible causes of swelling behind the knee include abscesses (infections); tumors of the skin, soft tissue, or bones; bleeding; deep venous thrombosis (blood clot in the deep veins of the legs); or deformity of the joint after a fracture of any of the bones of your knee joint. What causes pain behind the knee ? There are many cases of pain in back of knee, and the most common are baker’s cyst, tear in the meniscus, injuries to the hamstring, patellofemoral syndrome, and tumor. Arthritis (also known as inflammation of the joint surfaces) is marked by redness, swelling, fever or local warmth and moderately severe pain that aggravates after physical activity. There are different varieties of arthritis (infectious causes are mostly due to local trauma or invasion of microorganisms from blood stream leading to septic arthritis). Other varieties of arthritis that may produce pain behind knee joint are rheumatoid arthritis and osteoarthritis (that produce symptomatic pain and limitation of movement due to wear and tear changes of articular cartilage). It someone experiences a tear in the cartilage of the knee or has arthritis, it’s possible that fluid can fill up in the back of the knee in an area called popliteal space. This is called a Baker’s cyst. The extra fluid fills up the compartment within a cyst-like structure and creates pain in back of knee. Cysts are usually drained with a medical process called aspiration where a needle is inserted into the cyst and the fluid is “vacuumed” out. There are other methods that a baker’s cyst is drained. For example, by bandaging the area, it’s possible to compress the cyst, forcing the fluid out. Another method is by using ice to decrease the swelling in the knee, and a final one in administering corticosteroids, which are well-known for their ability to decrease inflammation. Once the inflammation is reduced, it’s possible that the body will reabsorb the fluid of the cyst. The reason why doctors are concerned about Baker’s cyst is because it may rupture if stressed from walking or other activity. A rupture will be followed by very sharp pain behind the knee. The swelling could involve the lower part of the leg as well as just the knee. The meniscus is cartilage in the knee. If it tears, then the body has to overcome a lot to get the area to totally recover. The meniscus doesn’t receive much blood supply, and if it tears, how can it heal without a blood supply bringing in oxygen and nutrients to start the healing process? A tear in the meniscus causes pain behind the knee. Besides this, a tear can also lead to the development of arthritis later on in life. Surgery is the treatment that doctors prefer, although the pain in back of knee will continue for quite some time after surgery until the knee heals. The hamstring muscles are located in the back part of the thigh and end in a common tendon. If a sudden shock is felt on the muscle, there will be pain behind the knee. There will also be swelling due to inflammation. Injuries to the hamstring are treated with RICE (rest, ice, compression, and elevation). Depending on the extent of the muscle injury, surgery may be recovered. Unfortunately, the pain may continue for a few months until healing is complete. Deep vein thrombosis is reported frequently in individuals who have protein C or S deficiency, chronic history of coagulopathy or immobilization, recent surgery or other similar hypercoagulable state that leads to formation of thrombus in the deep veins of the legs. Symptoms of pain and discomfort behind the knee and along the legs (or thighs) is associated with ischemia produced by activity and lack of oxygen supply due to partial or complete occlusion of blood supply. Obesity (or body mass index over 28 kg/ m2) leads to degenerative changes in the connective tissue component of the knee joint. Weight reduction is an ideal remedy in all such cases. 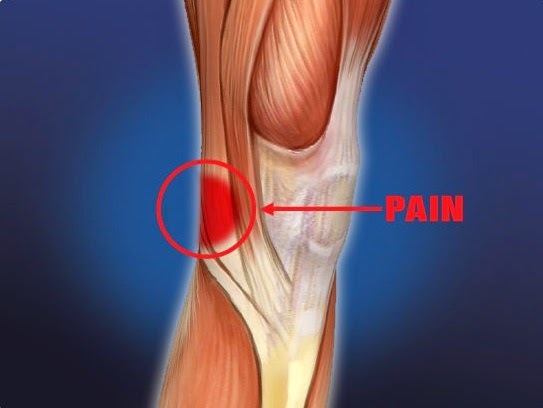 Overexertion of tissues (muscles, tendons and ligaments or other components of connective tissue) is another leading cause of pan behind knee joint. Other common causes include fracture or dislocation of knee joint or other aligning bones (tibia and fibula) that may produces swelling, redness and severe pain that aggravates after minor activity or movement. Fracture may be traumatic or pathological (in case of weak bones due to mineral deficiency, malignancy or chronic steroid use). In addition, weakness of leg muscles due to overuse, chronic inflammation and endocrinological disorders may also lead to pain behind knee joint. Lastly, aging process is also responsible for pain and discomfort due to malnutrition and other causes. What are the potential complications of behind knee swelling? Swelling related to cancers may have life-threatening consequences, which depend on the type and stage (extent) of the cancer. Left untreated, swelling due to abscesses or serious infections may lead to widespread infection in the body. Behind knee swelling and associated symptoms can be due to serious diseases, so failure to seek treatment can result in serious complications and permanent damage. Knee pains are often accompanied by other symptoms that can aggravate the situation. Some of the most common ones are inflammation, tenderness, swelling, firmness (lacking the flexibility), as well as unbalanced movement. Different person may react differently as well when exposed to certain stimulants or situation. In one person, the pain might emerge when doing an activity such as running and walking. On another person, the ache probably appears even when he/ she is not doing anything. In some cases, exposure to water may also trigger the pain to come up. One of the most usual causes of pain behind knee is damaged ligaments. While it can happen to anyone, obese people have higher risk of jamming their knee ligaments. This is due to the tremendous pressure from the body weight which the knee has to withstand. Often, worn-out ligaments are indicated by a mild popping noise which emerges every time the knee moves. If you have noticed this, we recommend that you consult your physician ASAP. Doing weight bearing activities is a main cause giving rise to health troubles like knee pain. To reduce the occurrence of discomfort in knee, it is recommended to avoid doing weight bearing exercises. Applying ice pack on affected area is one of the natural tips to reduce pain in knee joints. If you wish to get satisfactory result, never hesitate to apply ice packs on affected area four times per day. As per studies, keeping your knee raised is found to be very effective to reduce swelling down. Hence people suffering from knee pain are advised to raise their legs to a little height. Wearing an ace bandage on affected area is another natural way done to reduce the effect of swelling. Today, it is very easy to get ace bandage from local pharmacies. At times, keeping pillows underneath or between knees is an effective remedy recommended to prevent pain and swelling in legs. In certain cases, natural remedies won’t be enough to cure knee pain. Here, it is recommended to use pain relieving tablets like ibuprofen or acetominophen. To get best result, always make sure that the prescribed medicine is consumed as per the correct dosage level. Excessive physical activity is a common cause reported for the formation of knee or joint pain. If you do regular exercises, it is recommended to do warm up before starting it. Running straight down the hill can negatively impact the natural health of knee joints. Always keep a practice to walk slowly down the hill instead of running. As per studies, regular doing of exercise is one of the natural ways to reduce the occurrence of health troubles. To reduce the occurrence of joint pain troubles, it is advised to arrange a definite time schedule for doing regular exercises. Over the years, the ways on how to reduce the pain especially around the knee area are developing. From simple DIY massage techniques to specialized medication, there surely are plenty of choices and remedies for different knee pain that people can use these days. When choosing the right remedy for any pain in general, considering important point such as the severity of the pain, longevity, as well as the exact location of the pain. Certain types of treatment, whether it is natural or medicine-based, must be tailored to the person depending on the persisting symptoms and other related factors that will determine whether the treatment may work and not otherwise. Massage remedies are best and the most preferred by some people because it does not involve synthetic medication that may cause side effects in a long run. However, massage therapy is not applicable in all cases and in all situations. So when massage therapy can only be chosen as the main treatment? Basically there are several things that determine whether to choose massage therapy over the traditional mode of treatment. When the pain is tolerable and seldom occur, then massage therapy may work in that situation. One of the core benefits of massage therapy to alleviate the pain caused by pain behind knee is the decreased chance of long-term effect that may be caused by pain killers. If massaging doesn’t seem to work, trying different regimen can be your option. One of which is the doing physical exercise. Although there are some preparations to do before committing to resort to physical exercise to decrease the pain caused by the pain in the knee. Doing knee joint exercises has plenty of benefits and advantages. For one, this can actually increase the mobility and regain the knee’s lost strength. Aside from increasing the knee’s endurance and regain its lost strength, exercising can also help reduce muscle tension and pain. Although physical exercise as a means to reduce knee pain particularly on the back area, there are some precautionary measures that people should look into. Since knee pain is a very delicate condition, a careless exercise routine may worsen the pain. Over the counter pain- killers like non-steroidal anti-inflammatory drugs are overly helpful in decreasing the pain symptoms. However, in the absence of a clear reason, it is recommended to avoid blood thinners or other anti-inflammatory medications without seeking help from your primary physician. Obesity or being over-weight increase the stress and pressure on your lower limbs and delays healing. Additionally, wear and tear changes are more aggressive in obese individuals that further increases bone destruction and damage to articular cartilage. In certain conditions (when the cause of pain behind knee is an organic, infectious, cystic or inflammatory lesion), surgical manipulation is needed. The choice of procedure is dependent upon the extent of bone involvement and residual bone damage. What Causes Pain In The Back Of The Knee?